Bijou - A gem of a little salon in Skaneateles: Wear red on February 4th! Wear red on February 4th! Here is an email I received from one of our clients who thought about us, since they know we are big supporters of worthy causes. The clients at Bijou really are very special wonderful people! HI Kim, Friday, February 4th has been designated as, "Go Red for Women" by numerous organizations supporting heart health awareness. I have been an active participator of these programs since 1994 when I, at 42, had a heart attack. Not a good thing for anyone, but as a cardiovascular nurse, I was by far the worst patient ever to hit Crouse ICU. 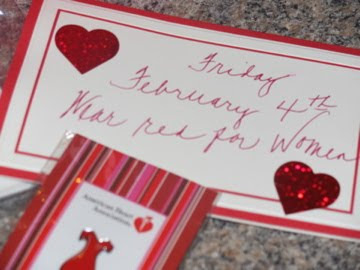 Friday, February 4, 2011, is National Wear Red Day—a day when Americans nationwide will take women's health to heart by wearing red to show their support for women's heart disease awareness. Join The Heart Truth on National Wear Red Day to help spread the critical message that, "Heart Disease Doesn't Care What You Wear—It's the #1 Killer of Women." 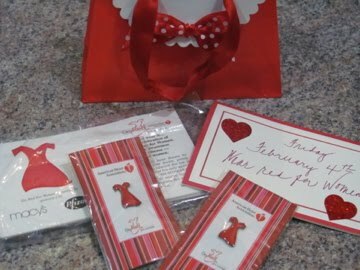 Everyone can participate in the national movement by wearing their favorite red dress, shirt, tie, or Red Dress Pin on Friday, February 4, 2011. The Heart Truth launched the Red Dress as the national symbol for women and heart disease awareness in 2002 to deliver an urgent wakeup call to American women. For more information on how to get involved, visit the National Wear Red Day toolkit which provides useful information and resources that you can use to help celebrate National Wear Red Day in your community.